You’d be hard pressed to find a single bride who doesn’t want to look her best on her wedding day. And a large part of that is finding a wedding dress that’s best for you and your wedding. That’s easier said than done: one woman shared her story of trying over 80 gowns before finally settling on one. And while that may sound crazy, factor in indecision, upfront and hidden costs, and simple trying to find something that’s both flattering and matches your style, it’s no surprise. Too many opinions: Randy Fenoli, a fashion designer and host of Say Yes to the Dress, sees this mistake all too often. Bringing along the maid of honor, and maybe your mother, can be fun, supportive (as long as you have a healthy relationship) and may help you decide. But the more people you bring, the more opinions you’ll have. That can create confusion, chaos, and erven bad feelings in your bridal party over disagreements–crowding your own opinion out. You aren’t dressed to shop: You might be focused on putting on a nice dress or slacks, but what you wear underneath for dress shopping is more important, since it’ll affect the way the dress looks and fits. While you may not know exactly what you’ll be wearing on the bid day (which is what you need to wear to fittings), stick with a plain strapless bra, underwear without print or patterns, and shapewear if you plan on wearing it. And for the sake of avoiding embarrassment, stick to as close to white as possible. You don’t make enough use of the consultant: You may pride yourself on being independent and shopping savvy, but dress shopping is not the time. A consultant can not only help you narrow down your options, but even make suggestions for accessories, and troubleshoot what fabrics would be best for your venue type. You fall in love too quickly–or not at all: Rarely a problem, but some brides love almost everything they try ands end up settling for a gown that’s beautiful but not the most practical option. Other brides, despite liking dresses, look for so long they wear everyone else out. Not everyone gets that ‘moment’ when they find a gown. If you’ve been to several shops and tried dozens of dresses on, try talking with someone about why you haven’t selected one yet. You focus on the wrong details: Maybe you love beading or sleeves. 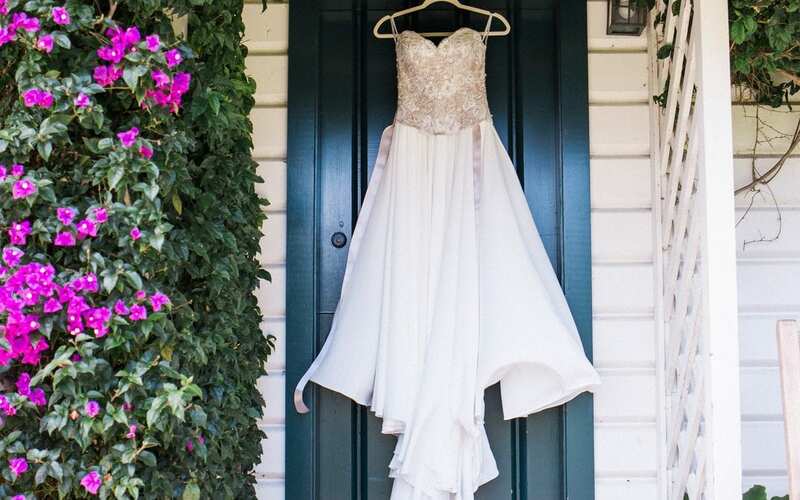 It’s great to have an idea of certain features you’re looking for, but keep in mind you can make mild alterations: if you are otherwise in love with a gown, it’s often possible to add beading os straps. Just ask your consultant, and make sure you first and foremost focus on things they can’t be altered as easily, like the silhouette and fabric. You’re searching for a perfect fit off the rack: Fit is important, but unless you’re buying a sample dress, don’t expect it to be perfect until you attend fittings. A consultant will try to fit it as much as possible, using a clip, to give you an idea, but know it will be altered. Also don’t worry about sizes: bridal tends to run small, so there’s no reason to stress if you’re 2 or even 4 sizes up than usual.